Has Facebook Achieved What AOL Could Have a Generation Ago? 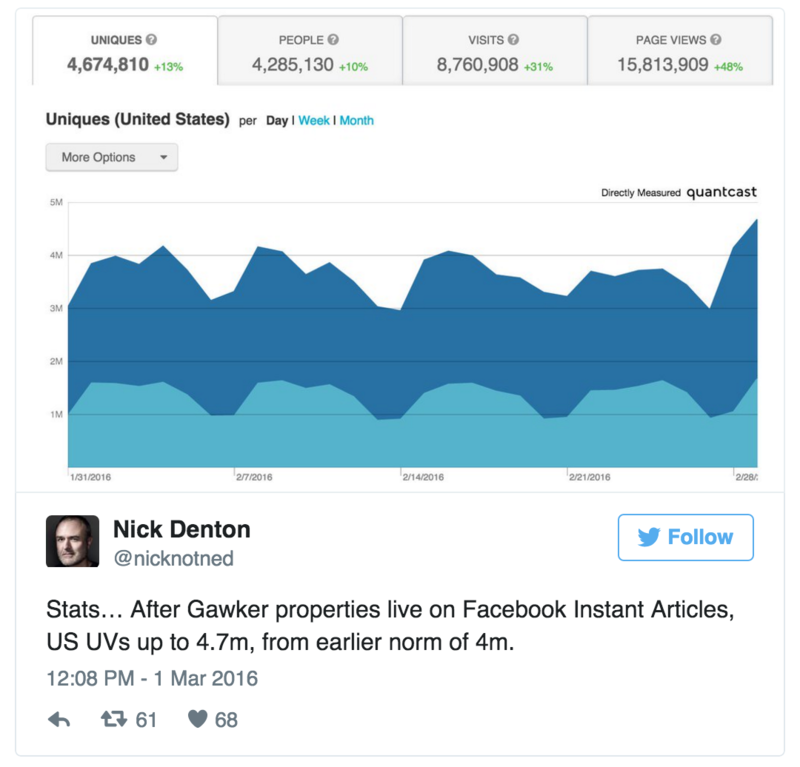 Recently, Facebook opened up Instant Articles to all publishers. If you don’t know, Instant Articles are Facebook’s new way to natively load articles within the app using an adapted RSS feed. These native articles, which have a lightning bolt in the top right corner, load in half a second—10 times faster than if a user was to click out to a website. From what I’ve seen so far, they really do load instantaneously and have a great layout and provide a good user experience. And, if you’re paying attention, you’ll understand that this is their third push for native media consumption: first photos, then videos, and now written content. Mark Zuckerberg announced native Instant Articles as a feature update about a year ago and Facebook has since been slowly rolling out the product and making improvements. Facebook started with the biggest publishers in the game: BuzzFeed, Huffington Post, New York Times, Washington Post. BuzzFeed has seen their Instant Articles engage more people than any of their standard link posts and Gawker’s founder tweeted that instant articles boosted daily “uniques” to their website. However, as of recently, Instant Articles became available to anybody with a Facebook page and a blog. This is a key opportunity for small blogs and publications to get ahead of the game and really understand how to best use the new product. For example, not only can publishers create and distribute mobile-friendly content, but they can also monetize the ad space within each article. Publishers will be able to directly sell their own display ads and keep 100 percent of the revenue and utilize Facebook’s Audience Network, their programmatic ad network (which considering the user-data Facebook has, is killer). Of course, just like any other update, there will be winners and losers depending on how you play the game. It’s up to you to test and figure out what works best for you. But when I really look at Instant Articles and the other new updates, I’m asking myself one question: Has Facebook been able to achieve what AOL could have a generation ago? Let me explain. If you think about our behavior on AOL in the early-to-mid 90’s, people never really left AOL to go on the web. After they logged in with dial-up, not only did they have email and instant messaging, but they were also on a page that provided them with (slightly curated) news, weather, videos, images, games, and articles. Users had no reason to leave the AOL hub to explore the Internet on their own. Sound familiar? If Facebook is able to pull off this move from a media standpoint, they will be the layer of medium consumption above the Internet itself. Think about it: now instead of going to Time, Inc., or Sports Illustrated, you’re consuming through and in Facebook’s native environment. There’s no reason to leave Facebook’s app at all. Having an all-native interface that’s overlaid on top of the World Wide Web is the ultimate ambition for an internet company. It’s an ambition that nobody thought was going to be possible after AOL lost its foothold in the last decade. Facebook is dangerously close to being able to pull it off. If Zucks was able to acquire Snapchat 18 months ago like he wanted to, and if they were to develop an OTT (over-the-top) network that competed with Netflix, Facebook would basically be the anointed winner of the entire Internet.